Their play is their work. It’s how they experiment, problem solve and express their ideas. The Twos Program at The Episcopal Preschool is a great beginning into the educational journey of your child. Our goal is to create a bridge from home and family to a wider world. We believe that “learning through play” develops self-confidence, spontaneity, and a life-long interest in learning. Twos interact through observation, imitation, and sometimes through parallel, cooperative or dramatic play. 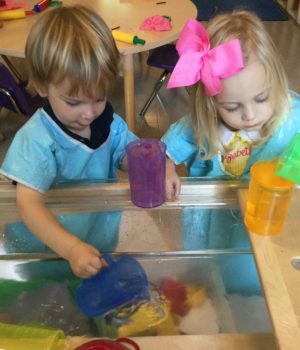 In our preschool, children learn to interact in a group, negotiate with their peers, and begin to learn the give and take (sharing) of group play. The curriculum provides experiences in art, science, math, language arts, sensory materials, music and movement and imaginative play using multiple centers around the room. Age: Two turning three by March 1st. Exceptions are considered, so please contact the Director to discuss exceptions or special circumstances.